Now the serpent was more crafty than any other wild animal that the Lord God had made. He said to the woman, “Did God say, ‘You shall not eat from any tree in the garden’?” The woman said to the serpent, “We may eat of the fruit of the trees in the garden; but God said, ‘You shall not eat of the fruit of the tree that is in the middle of the garden, nor shall you touch it, or you shall die.’” But the serpent said to the woman, “You will not die; for God knows that when you eat of it your eyes will be opened, and you will be like God, knowing good and evil.” So when the woman saw that the tree was good for food, and that it was a delight to the eyes, and that the tree was to be desired to make one wise, she took of its fruit and ate; and she also gave some to her husband, who was with her, and he ate. Aaahhh...the serpent. Everything was perfect before he came. God had given Adam and Eve free reign of all of Eden, dominion over the earth. Then the serpent came and messed it all up. How? He led Eve to believe that she was missing something by not eating from That Tree. She was content until the serpent introduced the possibility that there was something more, that she might be missing out. In one fell swoop the serpent managed to change Eve's (and Adam's) hearts, by insinuating that in spite of all that God had given them, they were still lacking. Somehow their hearts turned from happy contentment with all they had been given, to lustful longing for the one thing that they had been denied. Discontent caused them to trade everything for something that turned out to be a curse to them and their offspring. Adam and Eve had never considered eating from the fruit of the tree until the serpent told them that it would give them something that they didn't already have. Not that the serpent is entirely at fault. Eve allowed her senses to lure her away from the truth that God had given her. Instead of being happy with what she had received from the Lord, through no merit of her own, she looked to gain even more. She allowed someone from outside, who didn't have the same relationship with God, who didn't even appear to know the details of the command that God had given to Adam and his wife, to influence her heart. She acted according to what was pleasing to her senses ("a delight to the eyes"), and a desire for more ("you will be like God"), totally forgetting that her Creator had expressly forbidden her to eat from the tree. Since then, the serpent has continued to lure us away in the same manner. He whispers to us that there are things that we might be missing out on, he encourages us to go after more when we have already been blessed with much. We hear whispers in our ear that somehow, all that we have and all that we are, are not enough, we're missing something that we should have. He insinuates that God is holding out on us, so we must go after some things ourselves. And we allow the lust for more, and the allure of what we think could be better than our covenant with God, the desire to have it all, to pull us away from God. Somehow we convince ourselves, subtly, but powerfully, that we need more than what we have. Once that desire for more becomes rooted in our hearts, it blossoms into a tree bearing poisonous fruit: jealousy, covetousness, greed, malice, gluttony and more. We pursue what our hearts desire, because the promise that God will give us our heart's desires isn't enough. The fall of man is rooted in subtle discontent that blossomed into a lust for power. But acknowledging God's sovereignty in every area of our life, trusting in Him to provide, being confident that what He does is for our good, plucks up the discontent that begins to nestle in us. 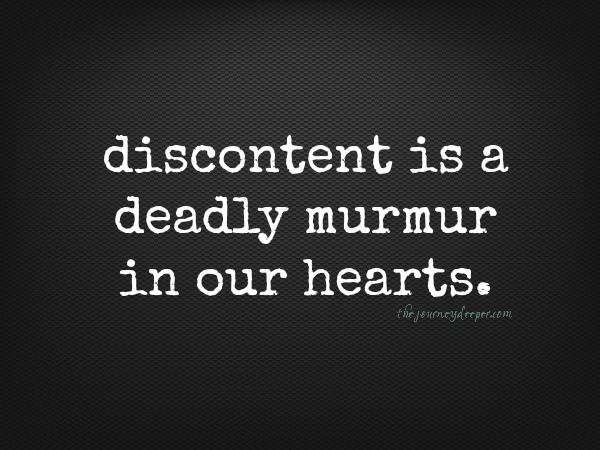 Discontent is a deadly murmur in our hearts. Be blessed and shine in contentment! This is a wonderful read! contentment is truly a good thing. Thank you so much! I'm glad you enjoyed it! And yes, contentment is indeed a good thing! So true. Adam should have protected his wife. So true that discontentment leads to so many other things. God is the best thing we could pursue yet I often choose something else because I think I am discontent with Him. Amen! You are so right! Thanks for stopping by!